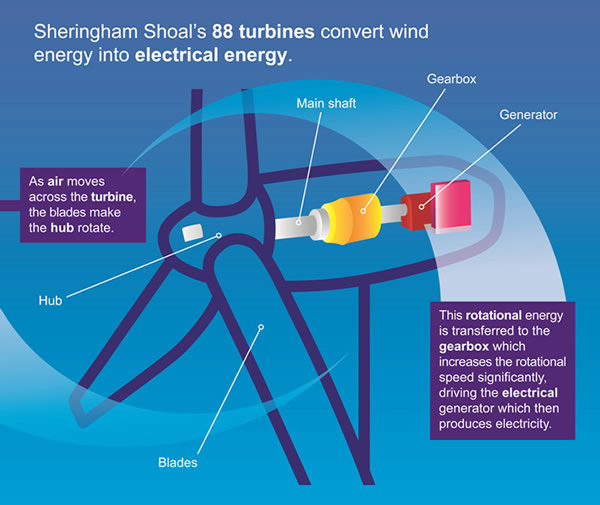 The wind turbines of Sheringham Shoal convert energy from the wind blowing in the Greater Wash into electrical energy. First the wind blows on the aerodynamically shaped blades to make them rotate along with the central hub. The hub is connected via a hollow shaft into a gearbox, which increases the rotation speed enough for the generator to convert the rotational energy into electrical energy using magnetic fields. The Siemens turbines employ a power conversion system enabling the generator to operate at variable speed, frequency and voltage. The power conversion system in the nacelle converts the alternating current (AC) produced by the generator to a direct current (DC) which is transmitted to the base of the tower. The use of a higher voltage increases the efficiency and reduces the losses during the power transmission. The power generated by the turbines is transmitted via 33kV infield cables into one of Sheringham Shoal’s two offshore substations, where it is collected and transformed from 33kV into 132kV. It is then transmitted to shore via two 23 kilometre long export cables – one from each substation. As well as carrying electricity, the export cables contain fibre optic cables for carrying computer and phone signals. The onshore cables transport the power an additional 22 kilometres inland to the new Salle substation where it is fed into the regional grid, eventually connecting to the national grid in Norwich for general use by British consumers. Internal schematic of a wind turbine.